Poor guy. Anyway, all that site searching turned up nothing but a Farm of Plenty, which is completely useless (no gems, just 50 supply points and that effect does not work due to bugs). 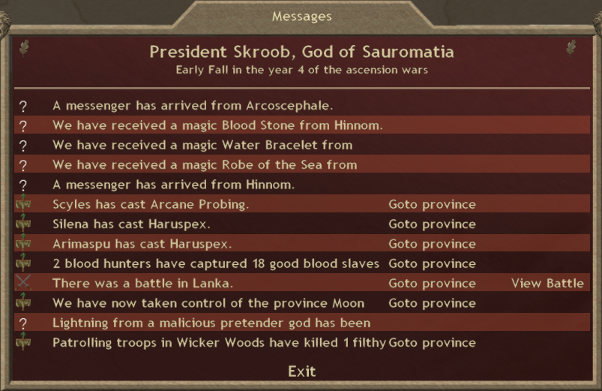 My hunters gathered 18 blood slaves, my priests were busy sacrificing and calling the Earthmother, and there was a little bit of army movement. I have a second underwater force (a Witch King and some Shades) headed into the southern lake, where Hinnom has agreed not to expand into the two easternmost water provinces. My first underwater force has grown a little bit (by recruiting some mermen during the previous turn) and moved north into an undefended province held by Mictlan. That movement isn't an act of war, it's just part of the deal I made with Lilli in earlier turns (she was willing to give me water provinces that Dexanth wasn't, and she only wanted me to withhold aid in exchange). My large Androphag Archer army finally makes its first move into Panic territory (although that battle won't be resolved until next turn). Naiades are amphibious, have Awe(+5), are stealthy, and have recuperation. They also have homesickness and as a result this unit will not be leaving my capitol (where she was summoned) for more than a couple of turns. Seriously. 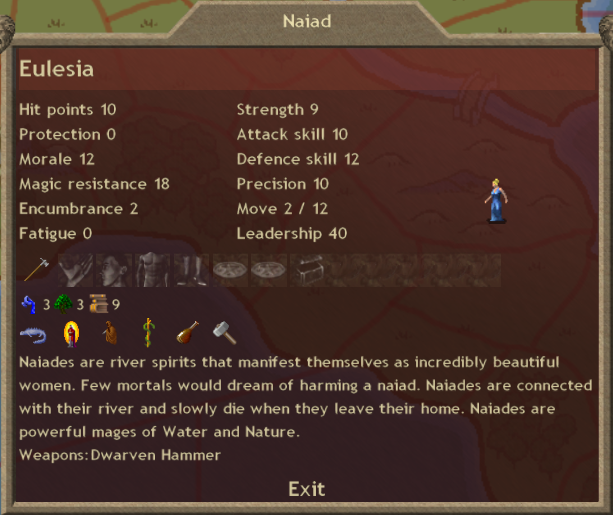 I gave this Naiad a Dwarven Hammer as soon as she appeared because she's W3N3. That means that she has enough paths (without boosters) to forge a Clam of Pearls. Technically the Witch King I used to summon her is also capable of forging such an item, but hammers and water boosters are in limited supply and I often have Witch Kings haring off around the empire for various tasks. The Naiad will be a dedicated Clam forger for at least a little while--until I run out of water gems anyway--and will kind of sort of almost help deaden the sting of being so far behind everybody else in terms of gem generation. It also helps me to know that between negotiations and untapped independents I am expanding my territory at almost no cost to myself, and I expect the coming T'ien Ch'i surprise to net me a few more territories with minimal losses. With my dominion stable, nobody attacking me, my research project on track, and my borders expanding I am feeling pretty good about my prospects for the future. 4. Extract blood price from Arcoscephale (600 gold).